Lymphedema is the swelling of a limb or other body tissue that occurs when vessels that form the lymphatic system are blocked or there is an increase in lymph fluid. The lymph system vessels carry excess protein and fluid to the blood stream. Tiny round organs called nodes line the lymphatic system and trap toxins and foreign bodies, such as bacteria. If you have lymphedema, you can lose weight through exercise and healthy eating. Exercise may improve circulation in your lymph system and reduce the swelling of your lymphedematous arm or leg, even though lymphedema itself cannot be cured. Because lyphedema has multiple causes, there isn't a single weight loss program that will work for all lymphedema patients. Get approval from your physician that you can safely undertake a weight loss program. Because lymphedema has many causes, including cancer, infections, surgery, radiation, and genetic lymph system problems, it is important that your weight loss program not aggravate your lymphedema or your underlying medical problem. Join lymphedema online support groups, such as the forums of the Lymphedema Awareness Foundation, where you can ask your peers for advice on safe exercises and diets. Review information on how different exercises and sports affect lymphedema patients. For example, in an essay titled "Cool Tips For A Hot Summer," the National Lymphedema Network recommends low-impact exercises, such as swimming, and warns that activities such as tennis where your lymphedematous limb might be hit by a ball or has to engage in repeated movements against resistance may be more risky. But the National Cancer Institute disagrees and suggests that breast cancer patients with lymphedema try aerobic exercises and slowly progressive weight lifting. Meet with a dietitian and create a healthy diet that matches your weight loss goals. At the present time there is no special lymphedema diet. For example, MayoClinic.com urges lymphedema patients to eat plenty of fruits and vegetables, which the same weight loss advice given to people who do not have lymphedema. Seek out experts on obesity if you weigh more than 100 pounds beyond a desirable body weight and also have lymphedema. An article published by "Ostomy Wound Management" magazine describes a lymphedema epidemic among morbidly obese patients and urges them to consider specialized care, including bariatric surgery, in which the size of the stomach is reduced. Take special precautions to protect your lymphedematous limb or tissue as you start your weight loss program. 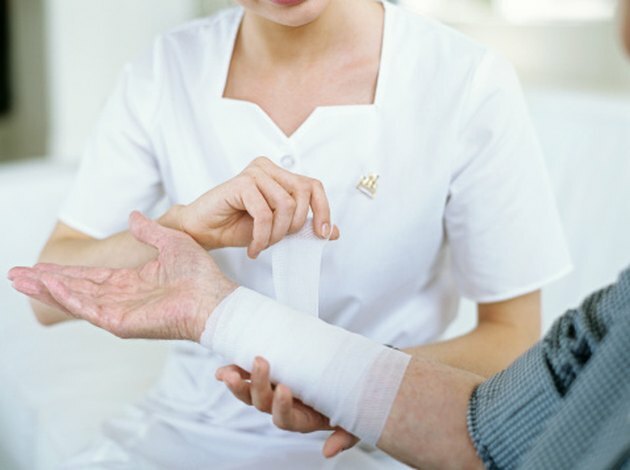 Physical therapist Bonnie B. Lasinski, MA, PT, CLT-LANA, on website Lymphedema Treatment warns patients to always wear their compression garments or compression bandages on their affected limb whenever they exercise. Swimming, cycling and quick walking are less risky for lymphedema patients than tennis, bowling and jogging, but patients should feel free to engage in activities such as jogging if it does not worsen their lymphedema. If the lymphedematous limb is swollen before exercising, patients should elevate it and rest instead of exercising that day.